What is the Benchmark Price for Hemp Biomass? Data is king, but in the quickly growing, and now legal, hemp industry, it can be hard to come by. Establishing a hemp biomass wholesale benchmark has been near impossible in the past. However, new data from Kush Marketplacemakes it possible. While we would prefer to examine only hemp biomass, the data for Q4 of 2018 is a bit limited. To assist, we will look at the hemp industry as a whole for part of our analysis. What Are Hemp Raw Materials? Hemp raw materials is a term used to describe the products created from the entire hemp plant. Raw materials include seeds, biomass, flowers, and transplants. While rarely is the hemp industry viewed on a large scale, looking at raw materials gives us an indication of what future prices may look like. In this article we will review sales data collected from October 2018 – March 2019. While this data is a good representation of the market, it is not all encompassing. Please keep that in mind while making decisions regarding your business / company. Are Wholesale Hemp Biomass Prices Going to Drop or Climb in 2019? Ever since the 2018 Farm Bill passed, the hemp industry has been under a microscope. New farmers are entering the industry each day and states are scrambling to get regulations in place. Transporting hemp between state lines has proven to be a challenge. This might present larger issues to the industry that could cause regional prices to spike or fall. The market is uncertain at best, but demand for hemp and CBD products is only growing. Looking at the data that we currently have available, it appears prices might actually climb. From October – December of 2018, hemp biomass averaged only $54 per pound. This amount has jumped to $57 per pound in Q1 of 2019 and is expected to grow beyond $65 per pound in Q3. So, What is Wholesale Hemp Actually Worth? Let’s dive into the data a little more. What has pricing looked like over the last six months? The chart above shows a unstable market in rapid growth. Hemp biomass prices continue to shift, but the trend upwards is clear. One of the largest deciding factors in pricing has been CBD percentage, but the overall market continues to climb. Buyers are clearing dying to get their hands on quality hemp biomass. Looking at the chart, we would expect to see the Average Offer Accept Priceto be consistently lower than the Average List Price, but this isn’t the case. In fact, the Average Offer Accept Price for hemp biomass is 102% of the Average List Price. This is staggering! In fact, the average offers received on hemp raw materials listings is 1.47. With most products receiving multiple, competing offers, sellers have been able to increase the wholesale price of hemp biomass. This is in stark contrast to cannabis, which is seeing the market begin to level out. Looking back to October 2018, hemp biomass has sold for around $35 -$75 per pound, with an average of $56 based on actual sales data. Despite having historical data, hemp biomass is more difficult to price. With the passing of the 2018 Farm Bill, the hemp market is sure to be flooded with product from new growers in 2019. It is unknown how these new producers will impact the hemp industry. While some believe prices could crash, especially with brands like Coca-Cola setting a price floor, others think this is the time to invest. Demand is set to grow at a rate that farmers may not be able to keep up with. Based on how prices have fluctuated over the past six months, it is hard to set a baseline. 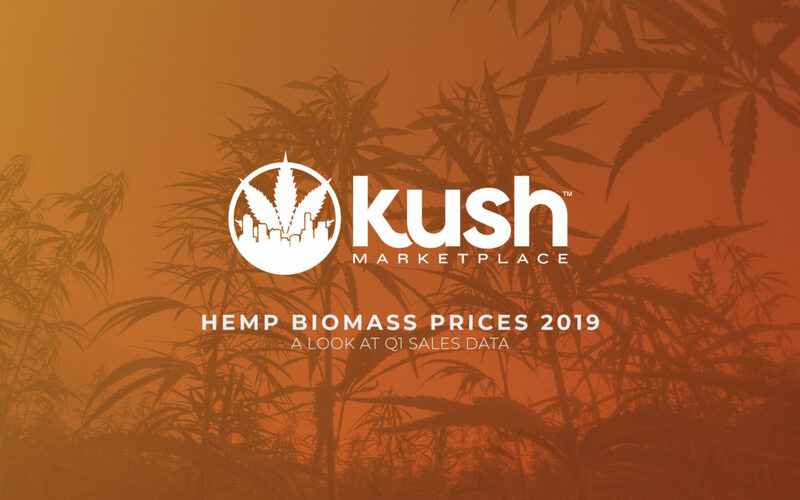 Kush expects to see hemp biomass prices continue to climb throughout the summer. So, How Much is a Pound of Hemp Biomass Worth on the Wholesale Market in 2019? Hemp biomass typically sells for around $35 -$75 per pound, with an average of $56 based on actual sales data. Everyone has their own sales method. Some rely on personal connections, others on industry knowledge. There are a number of ways that you can get more for your products, and Kush Marketplace is a great place to start. On average, hemp sellers on Kush Marketplace receive 118% of their listed price. With most listings receiving multiple offers, it makes it easy to understand the true value of your products. Kush Marketplace works with one of the largest network of buyers. We are actively searching for new hemp and CBD products. Not getting an offer that you think is fair? Reach out and one of our helpful sales reps will connect you with a buyer that matches your needs.